This is the third and last post of my observations after 2000 sermons and 25 years of pastoral ministry. In the first two I talked about preaching and about churches. This one will be about people. Of course every pastor could share the good, bad, and ugly about people (and people could share the same about every pastor). I want to present this as the kind of people I have known and am thankful for. I have known and am very thankful for little old ladies who pray. It seems there is always at least one. They are sweet, gray-haired, teetering, reedy-voiced, mighty prayer warriors. I remember when one of them in the church I pastored passed away. At her funeral, I held up her name-filled prayer notebook and asked who was going to take her place. I would not be who I am, and the church would not be what it is, without these dear saints. I do not have sufficient words to give thanks for the people who suffer deeply and for long periods of time, who during their great trial give testimony to the grace and goodness of God. Whether through a terrible disease, a tragic death, a devastating family issue, or other major trial, these people not only avail themselves of God’s grace, they seem to overflow with it and become an encouragement to all around them. I am very grateful for the men who have been steadfast and strong and have been a source of strength for me when I am weak, wavering, doubtful, or discouraged. There have been 2-3 especially who, while in a position of leadership, have kept a steady hand on the helm as the church navigated rough waters. These men have become a stabilizing influence in my life and ministry. More than once I have been close to “hanging it up” and one of these men has provided timely encouragement and counsel. I praise God for them. What church and pastor could function without the person who will do just about anything, anytime, that is needed? Some people are just servants. They love to hear that there is a need, and they almost (sometimes literally) run to take care of it. There is no task too great or small. There is no time too early or late. There is no appreciation or compensation expected. They are sometimes willing to a fault, sacrificing personal time and resources for the sake of ministry. Whatever is needed, they make it happen. Yes, I am thankful for the people who ask the hard questions. There are people who, when a plan or decision is being discussed, will question the reasoning, or draw attention to faults in the plan, or disagree with the direction. There is almost always benefit from paying attention to what these people are saying. Most people who do this really care about the church and really support and love the pastor. Occasionally someone is just being disagreeable. Most often, the constructive critic highlights an issue that should be considered, thought through, explained better, or improved. That’s good for the church. I am thankful for the men who have given years of their lives to leading the churches I have pastored through a major building program. There is no way I could have done it as the pastor. It is beyond my ability and outside of my skill set. There have been key men who have provided the leadership in overseeing the construction as well as coordinating the process with the congregation in both churches I have pastored. They literally poured and invested a major portion of their lives into this ministry endeavor. The church benefited greatly from them. I am grateful for them. I praise God for the people who have had major struggles with sin and have overcome them. One example is a man addicted to drugs who was destroying himself and his family. He trusted in Jesus Christ to save Him. He met with me weekly, early in the morning at McDonalds, for discipleship and counseling. He grew and God delivered him. I also think of family situations where grievous sin threatened to destroy the marriage. I felt and witnessed the joy of repentance, forgiveness, and restoration. God is good. There is hope. It can happen. I am thankful for the people who access the grace of God for themselves and extend it to others. There are many more kinds of people for whom I am thankful. I’ll name one more. I am more grateful than I can ever say for my wife. The pastor’s wife is in a unique position. She can literally make or break her husband’s ministry. My wife’s name is Faith, and she lives it. Her faith has sustained me countless times. Her prayer for me, encouragement, wise counsel, joyful spirit, amazing forgiveness, and unwavering support of God’s calling on my life have, on a human level, made me who I am. No words can express the gratitude I have for her. Thank you, Father, for Faith. I want to commune with my Heavenly Father consistently and meaningfully. I spend time first thing in the morning reading the Word nearly every day. Then I begin to praise God and make requests to Him in prayer. And my mind races. Some of the thoughts that fill my mind are related to praying, but many are not – they are distractions. I start thinking about all kinds of things that are totally unrelated to what I am thanking God for and asking of my Heavenly Father. After some time I realize – I’m no longer praying, I’m thinking about something or someone else. A couple of months ago the speaker at our church men’s retreat stated that the Lord’s Prayer (Luke 11:2-4) is the model for how we should pray. I started opening my Bible to it and using what Jesus said to prompt and guide my own prayers. And then I realized something very helpful. When I find myself distracted by unrelated thoughts racing through my mind, I can easily turn my attention back to the words of the prayer in front of my face and get my thoughts and heart back on track. It really helped! So I decided to try something. There are other prayers in Scripture. Some are in Old Testament narratives, many are in the Psalms, there’s of course the Lord’s Prayer, and there are several in the Apostles’ writings, especially Paul’s letters. One morning I turned to Colossians 1:9-12 and wrote it out in my journal. 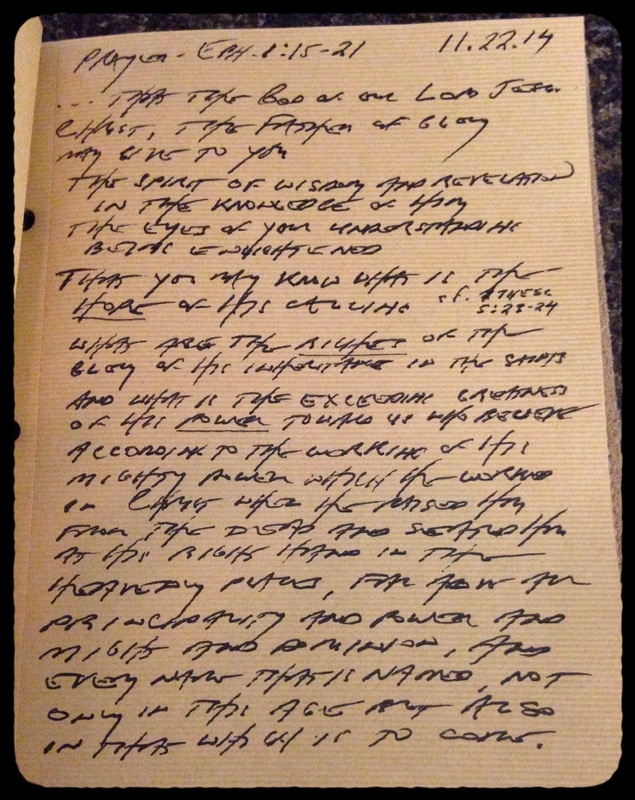 Then I held the open journal in my lap and used Paul’s requests to guide my own. And it worked. When I realized my mind was far afield, I glanced back at the page and picked up where I had left off. And I knew that what I was praying followed a biblical pattern. I used this scriptural prayer for a few days, then I wrote out another one, Ephesians 1:15-21. In recent weeks I have also used 2 Timothy 2:25, Psalm 23, and the first and last sentences from Deborah and Barak’s song in Judges 5, which I paraphrased as, Help me to lead, and the people to willingly offer themselves, and we will bless the Lord. Let those who love you be like the sun when it comes out in full strength. These prayers have helped me know how to pray, to keep from being distracted, and when I do find my mind elsewhere, to bring my thoughts back to my communion with the Lord. Because I have them in my journal, I can go back to them whenever I want, and can continually add new ones as I come across them or search them out in Scripture. I experience other hindrances to prayer, but distraction is a big one, and this simple practice has helped. Maybe it will benefit you too. We all need help praying. Author Dean TaylorPosted on December 2, 2014 December 2, 2014 Categories Bible Reading and Study, Prayer5 Comments on I need help praying.